Located at Ashby Parva, Midlands Roller Arena – book a party session or go to one of the many sessions listed on the website. There are also special events at Halloween and Christmas – check out the events page. Or go and watch a roller hockey match – it’s fast and furious. Add in a trip to Fosse Meadows. A country park where you can bird watch, orienteer, wander through woodland or play on the play equipment. If you would like to visit during an evening, please contact the friendly Rangers who will support you in organising your evening. See the website below for more details on facilities and how to get there. The Vulcan Bomber aircraft (a large American bomber) was based at Bruntingthorpe Aerodrome. This is why there is a really long runway at Bruntingthorpe (3.2km). You could make your own paper or balloon powered plane to rival the bomber. How high or far can your plane fly? You could even decorate your plane with your own airline. 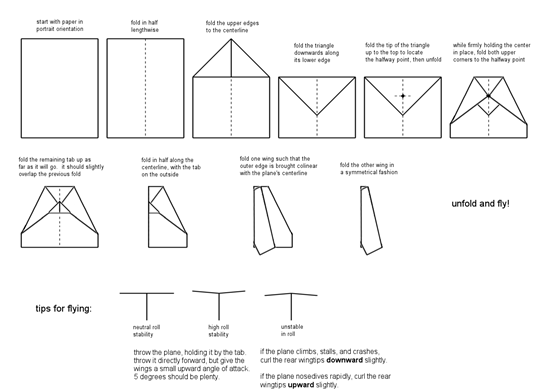 Follow the instruction over on the next page to make a paper aeroplane – you don’t have to use these. You could even plan a walk that is 3.2km in length and walk it. How long will it take you to walk that far?